Would it help to drink tea for fibromyalgia (FMS) or chronic fatigue syndrome (ME/CFS)? It just might. Tea is one of the most popular drinks in the world, but it's way down on the list in the U.S., coming in behind coffee and soda. In the past few years, however, studies suggesting health benefits of tea have certainly raised its profile and popularity here. So is it all hype, or is there something to it? According to research, it looks like tea has several things to offer, both for the public in general and for those of us with fibromyalgia or chronic fatigue syndrome. Much of the research is in its early stages and some results are contradictory, but a picture is emerging. Tea contains two things that appear to offer health benefits: polyphenols and theanine. While tea hasn't been studied specifically as a treatment for FMS and ME/CFS, we have research suggesting that these two ingredients may hold some promise for us. Polyphenols are a type of antioxidant. Antioxidants are probably something you know are supposed to be good for you but don't really understand. The science behind them is complicated and has to do with molecules called free radicals. For those who aren't really into the science, think of free radicals as broken-down cells. We all have some. But if you get too many, according to research, they can make you sick. Antioxidants have what those cells need to repair themselves and be healthy again. An emerging line of research has to do with the role of oxidation in FMS, ME/CFS, and some other related illnesses. Specifically, it's the build-up of nitric oxide, which leads to oxidative stress (too much oxygen-related break down). The scientists behind this theory believe that too much nitric oxide in the body starts a chain reaction that both triggers these conditions and keeps them going. The solution? According to a 2017 study in the Journal of Agricultural and Food Chemistry, polyphenols from tea (as well as cocoa, berries, and walnuts) may help reduce oxidative stress. Additionally, a study published by the International Journal for Vitamin and Nutrition Research in 2016 suggested that polyphenol-rich foods may reduce pain and improve quality of life in women with FMS. So tea may lower pain, treat and prevent disease, and improve your life. Not bad. Theanine, also called L-theanine, is an antioxidant as well. It's only found naturally in tea and a specific type of rare mushroom. A synthetic form is available as a dietary supplement, as well. Those are a lot of potential benefits. You won't get all that just from a single cup of tea, though. There's more to tea than pinky up or pinky down. 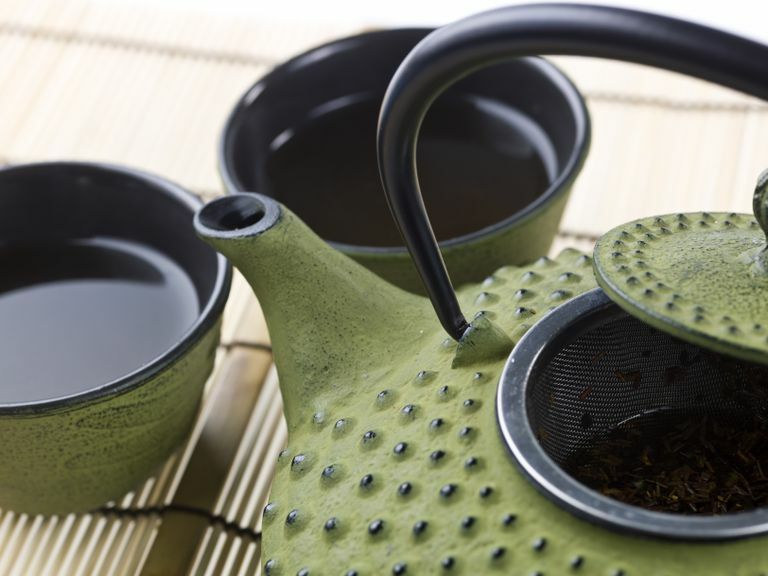 To get the full health benefits from drinking tea, you have to know a few things about it. Decaffeinated tea also comes from the Camellia sinensis tree, and the leaves have gone through a chemical process that strips out the caffeine. Be sure the package says "decaffeinated," though, not "caffeine free," or you may be getting herbal tea. Decaf teas do keep their theanine content through the decaffeination process, but we don't yet know if they retain polyphenols. The strength of the tea is important. Studies that did look at steep time suggested it took at least three to five minutes for the tea to reach the necessary strength to provide a health benefit. Depending on the illness studied, participants needed to drink between two and six cups per day to get enough polyphenols. Green and oolong teas contain more polyphenols than black tea. Bottled teas can contain a lot of sugar or artificial sweeteners along with other things you may not want in your diet, especially in high amounts. Be sure to check the ingredients list. Tea Tree Oil, also called melaleuca, does not come from the Camellia sinensis tree. While it may offer some health benefits, it doesn't contain theanine or tea polyphenols. Tea is generally thought of as a healthy beverage, especially if it's unsweetened. However, nothing is without possible risks. The biggest problem with tea may be that it contains caffeine in roughly the same amount as coffee (although amounts vary greatly based on several factors.) If you don't tolerate caffeine well, this is a big problem. Even decaf teas may contain trace amounts of caffeine. Also, tea contains a high amounts of natural substances called oxylates, which may contribute to the formation of a certain type of kidney stone. If you're prone to oxylate kidney stones, be sure to discuss this aspect of tea with your doctor before you start drinking it regularly. If you drink a lot of soda or coffee, and especially if you're drinking it for the caffeine, you may want to substitue tea for at least some of your daily servings. To get a consistent amount of theanine, supplements could be an easier choice, but remember that you'll be missing out on the polyphenols that way. Again, if you decide to use anything medicinally, even food, it's a good idea to bring it up with your doctor. Butacnum A, Chongsuwat R, Bumrungpert A. Black tea consumption improves postprandial glycemic control in normal and pre-diabetic subjects: a randomized, double-blind, placebo-controlled crossover study. Asia Pacific journal of clinical nutrition. 2017 Jan;26(1):59-64. Gonzalez-Sarrias A, Nunez-Sanchez MA, Tomas-Barberan FA, Espin JC. Neuroprotective effects of bioavailable pholyphenol-derived metabolites against oxidative stress-induced cyctotoxicity in human neuroblastoma SH-SY5Y cells. Journal of agricultural and food chemistry. 2017 Feb 1;65(4):752-758. Liao ZL, Zeng BH, Wang W, et al. Impact of the consumption of tea polyphenols on early atherosclerotic lesion formation and intestinal bifidobacteria in high-fat-fed apoE-/- mice. Frontiers in nutrition. 2016 Dec 21;3:42. Liu SM, Ou SY, Huang HH. Gree tea polyphenols induce cell death in breast cancer MCF-7 cells through induction of cell cycle arrest and mitochondrial-mediated apoptosis. Journal of Zhejiang University, Science B. 2017 Feb.;18(2):89-98.